Dr. Jacquie Smiles helps adults, teens and kids around Orange County, NY to achieve straight and attractive smiles with Invisalign braces. Instead of traditional wire braces, which use metal, Invisalign is made of clear plastic aligners that are custom-made for every individual. Patients who may be self-conscious about their uneven, crooked or spaced out teeth will love the beautiful smile that Invisalign can achieve within a short period of time. Dr. Jacquie Smiles has been an Invisalign Premier Elite Provider since 2002 and has been treating thousands of Invisalign patients in Orange County, NY. Invisalign braces are a great option for adults in the Orange County, NY area. Invisalign braces are transparent braces that fit on the teeth just like a mouth guard. Adults can now have a beautiful smile and a healthy bite without some of the embarrassment that accompany the traditional wire braces. There are other benefits to Invisalign braces for adults due to the way they are designed with more comfortability and gentle feel on the cheeks and the lips. It’s best for the orthodontist to see children by the age of 7 to advise if Invisalign treatment is required. Crossbites, crowding, excessive overbites and other problems can be evaluated and predicted at a very early age for kids without the use of x-rays. Our offices are equipped with TVs and videos games, which makes visiting Dr. Jacquie Smiles’ office more fun for the kids. Now teens don’t have to worry about embarrassing metal braces in their yearbook photos or social media profiles. Dr. Jacquie Smiles offers a clear way to straighten teeth without metal braces, using Invisalign for teens in the Orange County, NY area. Invisalign aligners are removable and virtually invisible, which means you can straighten your teeth without anyone knowing. You can still eat and drink what you want. You may also brush and floss normally to maintain healthy gums and teeth since there are no wires, metal or brackets to cause mouth abrasions. Treatment time typically ranges from one to three years for adults, kids and teens, depending on the growth of the patient’s mouth and the severity of the problem. Patients grow at different rates and will respond variously to orthodontic treatment, so the time completion may differ from the original estimate. The patient’s diligent use of any prescribed rubber bands or headgear is an important factor in achieving the most efficient treatment. 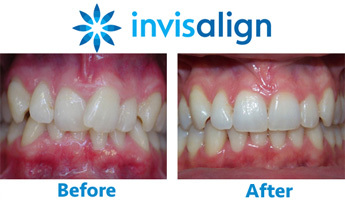 To schedule your Invisalign consultation with Dr. Smiles at her Orange County, NY dental office, please call (845) 782-4288 or fill out the contact form for your no-obligation consultation today. Dr. Smiles’ clinic is conveniently located at 505 Route 208, Suite #23, Monroe, NY 10950.